Those from around the Aitkin area can expect an abundance of different items at the Aitkin Farmers’ Market, including everything from fresh garden produce, eggs, baked goods, jams and jellies, live plants, yarn and wool products, handmade crafts and soaps, syrup, and flowers and herbs. In addition to fresh produce, products and goods, a number of returning and first-time local performers will be playing their original and cover songs for attendees at the Aitkin Farmers’ Market. A schedule of upcoming live performers will be rolled out in the coming months. Is your mouth watering yet? Then remember to mark your calendars and come out on Memorial Day Weekend, Saturday, May 26, from 9 a.m. to 1 p.m. to get the most of local Minnesota products. 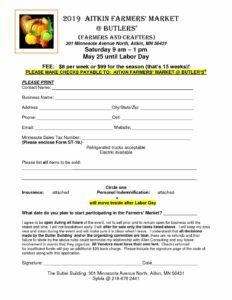 Farmers interested in participating can download the application, or Sylvia Allen, Building Owner, at 218-678-2441 to have an application sent to them directly.